colby lost his first tooth yesterday!! he just told me it was wiggly on friday after school. then it was falling out on wednesday. it officially fell out on thursday morning. he is so big!! and of course, it was picture day. so here he is just before school. isn't he cute?? this is a little old, but here are the cute kiddies. 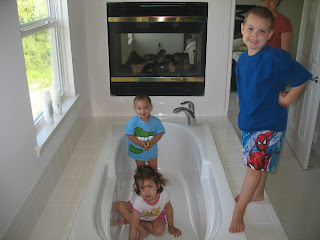 they were in michigan on vacation, and thought this bathtub was cooler than any toy. i'm sitting here with kids running everywhere throughout the house. it is mighty hectic right now. caleb is on the table throwing a ball to his friends, and rebekah and isaac are dressed up as princesses. 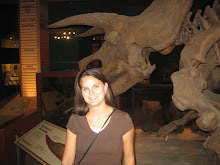 i had pics of that too, but they are floating around somewhere on the computer as well. they sure are cute, but very weird!! now, they are standing behind the shears over the window, and all three of them running across the room out of them. it is hilarious!!!! Your Colby is so handsome, he is the perfect mix of you and Nate.